Celebrating the life of Noah E. Broadway Jr.
Be the first to share your favorite memory, photo or story of Noah. This memorial page is dedicated for family, friends and future generations to celebrate the life of their loved one. 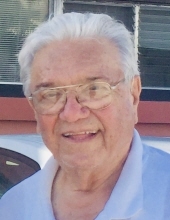 Obituary for Noah E. Broadway Jr.
Noah Edward Broadway, 93, of Sylvania, Ohio died Monday Feb 4, 2019 in Bradenton, Florida. Noah was born November 18, 1925 in Toledo, Ohio to Noah E. and Clara K. (Shaw) Broadway. He was preceded in death by his loving wife of 62yrs., Marge (Savage) Broadway and younger brother, Harry Broadway. A 1943 graduate of Libbey High School Noah played trombone in the marching band and often sang in school productions. Noah was drafted and served in WWII as an artillery observer stationed in Europe, fighting during the Battle of the Bulge. Noah was a long time member of the Sylvania American Legion Post 468. He leaves behind his six children, Charmaine McClellan, Tara (Scott) Hall, Debbie (Duane) Hammett, Noah (Pam) Broadway, Matthew Broadway and Kelly (Scott) Broadway-Houk; 12 grandchildren and 15 great grandchildren. Family and friends will be received at the Walker Funeral Home, 5155 W. Sylvania Ave. Toledo, OH on Thursday February 21, 2019 from 2pm-8pm with American Legion Services at 6:30pm. Funeral Services will be on Friday February 22nd at 11am at Walker Funeral Home. Interment with Military Honors by the Lambertville VFW Post 9656 will follow at Toledo Memorial Park. Memorial contributions may be made to the Kidney Foundation of Northwest Ohio, 3100 Central Ave. #150 Toledo, OH 43606. To send flowers or a remembrance gift to the family of Noah E. Broadway Jr., please visit our Tribute Store. American Legion Post 468 services at 6:30 pm. "Email Address" would like to share the life celebration of Noah E. Broadway Jr.. Click on the "link" to go to share a favorite memory or leave a condolence message for the family.